In this article, Drew Hendrix, Vice-President of Red River Paper explains inkjet paper basics that will help you select the best papers for your use. He’s shown here in Red River Paper’s huge, Dallas, Texas warehouse where hundreds of types and sizes of papers are stocked. –Today’s selection of inkjet papers provides amazing creative opportunities for photo enthusiasts by offering quality, control and cost savings previously unknown to photographers who worked with conventional photo papers. 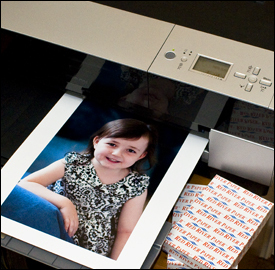 There are many more options to let you match the paper’s surface to suit your photographic style. Weight, texture, shade and more can finely tune the look and feel of your prints. Never in the history of photography has so much creative control been available to photographers but let’s face it, with hundreds of choices facing you, choosing the right inkjet paper can be a bit confusing. The kind of paper you use can make or break your image. 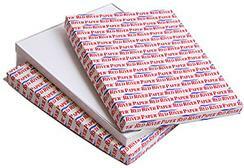 Inkjet papers are a special class of paper product. All include a base stock layer usually made from tree fiber or cotton rag content. What makes them special is a chemical coating on one or both sides. These chemicals trap ink droplets close to the paper’s surface exactly where they fall. The result is saturated color and sharp detail. The quality of this coating layer is a significant variable and not all inkjet papers are created equally. Don’t expect your office store’s ream of “coated inkjet paper” to perform at the same level as a luster paper made specifically for photo reproduction. In the early days of inkjet photo printing there were basically two types of papers (swellable and porous) and each had to be matched to the kind of ink (dye-based or pigment) used by the printer. But today’s newly-formulated inkjet papers can produce brilliant results with both kinds of ink. These papers can be broken into five categories and knowing the different options can help you choose the best paper types for new and continuing print projects. These are the best-performing types of inkjet paper, offering the most saturation, deepest blacks, and sharpest detail. Red River Paper uses state-of-the-art equipment, such as this powerful computerized paper cutter, to assure that every sheet of paper is uniform. 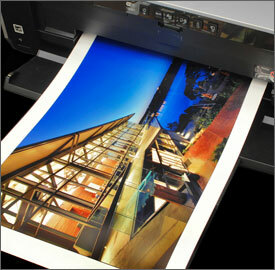 Matte inkjet papers are typically smooth and have no gloss or reflectivity. They don’t have the “snap” of glossier papers but they are capable of high quality photo reproduction and good saturation. When displayed without a glass overlay, matte papers are excellent for viewing at wide angles without distracting reflections . They are available in many weights and can be coated on one or both sides. In some cases you’ll find these products lumped in with fine art paper. I like to keep them in a separate class because baryta and fibre media are designed to mimic the look of air-dried darkroom prints which is unique. Sophisticated coating technology utilizing Barium Sulfate creates a lustrous, warm-white look– perfect for landscapes, portraits, and many fine art images. The four categories above comprise the majority of inkjet media you’ll find readily available. Since we can coat just about any flat surface, there are also a number of specialty products for your printing enjoyment. Beyond the surface type and base descriptions, technical specs will help you understand how a paper will feel and perform even before you make a purchase. Check the manufacturer’s website or look on the box to find these specs. You can use these references to mentally feel a paper before even taking it out of the box. Brightness is a paper’s ability to reflect light while whiteness is the color quality (in a range of warm-white to cool-white) of that reflected light. The “whiter” the paper the cooler or more bluish it will be. As photographers we should be much more concerned with the whiteness (or shade) of a paper than its brightness specification. The subject of your images comes into play when considering paper shade. For instance, portraits and landscapes may benefit from a slightly warmer tone while marine and architectural shots might look best on a cooler-toned paper. Still, it’s a matter of taste so experiment with different toned papers to see how they work with various subjects. A warmer or cooler toned paper can change the entire feeling of a print. As you can see, there are many factors that go into choosing just the right paper for the effect you want; here’s how to go about it. Start with surface and thickness. Then pick a warm, neutral or cool-tone paper. Next, if you don’t want the shade to go warmer with time, avoid optical brighteners. Finally, when you find papers that work for you, stick with them. Follow these simple steps and your prints will shine. 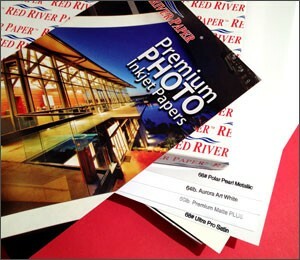 One of the best ways to become acquainted with different types of inkjet papers is to order one of Red River’s Paper Sample Kits. There are a variety of kits to choose from which will allow you to sample many different types of paper. Thanks for the article. I was wondering, what makes a particular paper suitable only for a dye or pigment ink, as one or two of your papers are? All inkjet media are dye ink compatible. A smaller subset are also compatible with pigment inks. The paper’s coating chemistry is responsible for ink compatibility. Older and less advanced coatings cannot properly lock pigments into place near the surface of the sheet. This causes dark colors to look washed out. As you noticed, only a couple Red River Paper products are not pigment compatible. Most mills now coat for dual compatibility. Great information, it added to my knowledge base. I plan on sharing this article with members of my photography group. Thanks for the article, very helpful. Your thoughts are very knowledgable and agree with my deep experience on this topic.